Women’s Artistic Gymnastics is a very demanding and challenging sport, requiring high level strength, power, speed, flexibility, endurance, agility, form, technical precision and artistic performance. Our Women’s Competitive Program is for the more dedicated athlete and focuses on development of gymnastics excellence in an environment where athlete safety, health and wellness is our first priority. In their personal pursuit of excellence, each athlete benefits from ongoing personal and physical development that transfers well to their academic life, social development and performance in other athletic programs. Vault requires speed and strength down the runway in order to generate sufficient momentum to produce a high and long post flight off the vault, essential for completing the various skills. Once in the air, the gymnast then focuses on sticking a perfect landing. Uneven Bars requires special timing to combine seeming effortless swinging elements with technically demanding ‘release’ moves, followed by the sticking of a perfect landing. Balance Beam demands great balance, strength and flexibility as the gymnast must perform demanding elements on a 10 cm. wide ‘stage’ that is 1 metre above the floor. merge her own unique personality and emotion into every performance while defying gravity in order to execute technically demanding tumbling elements. The Oakville Gymnastics Club Women’s Competitive Program features one of the most qualified coaching teams in Canada. The program structure includes Minis for girls 4 – 5 years of age and Developmental for girls 6 – 7 years of age, along with Invitational Competitive, Provincial and National program streams. 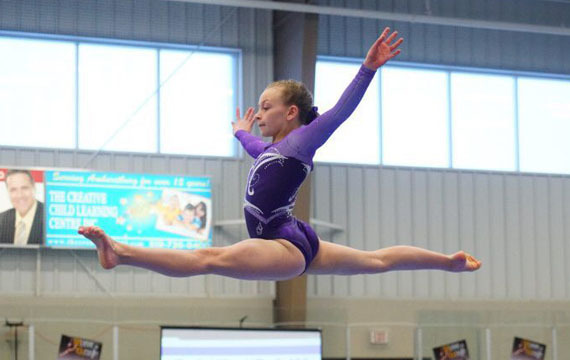 Oakville Gymnastics Club has competitive program tryouts each year. Please contact the club for further information. The Minis are a select group of young female athletes 4 & 5 years of age, that have shown a desire for a more demanding level of gymnastics, as well as a natural ability for the sport of gymnastics. These gymnasts train 2 days a week for 2 hours each day. The program features a fun, safe and caring environment and focuses on developing flexibility, strength, balance, endurance and technical form. The children will receive training on the bars, beam, floor, trampoline and other gymnastics apparatus. Gymnasts in OGC’s Minis program progress into the Developmental Program. OGC’s Developmental program features a fun, safe and caring environment with a focus on preparing talented young female athletes, 6 to 9 years of age, who desire a more demanding level of gymnastics, to become advanced competitive gymnasts. The program focus is on development of flexibility, strength, power, speed, endurance, basic skills and form, as well as technical skills and routine development for each of the 4 component apparatus – vault, bars, beam and floor. Our goal is to provide a complete development program providing each athlete the opportunity to achieve their maximum potential for possible entry into the Interclub, Provincial or National Programs. Our I.C. program is for a select group of young female athletes who desire a more demanding level of competitive gymnastics, but not necessarily for the commitment that the Provincial and National program streams require. The program focus is on development of flexibility, strength, speed, endurance, basic skills and form, as well as technical skills and routine development for each of the 4 component apparatus – vault, bars, beam and floor. Our goal is to provide a complete development program that provides each athlete the opportunity to achieve her maximum potential for possible entry into the Provincial Program. The provincial program is for the more dedicated athlete, where skill acquisition and routine building are the main focus. Entry into this program is not for everyone. Specific coordination, strength, and dedication are required. The program focus is on development of flexibility, strength, speed, endurance, basic skills and form, as well as advanced skills and routine development for each of the 4 component apparatus – vault, bars, beam and floor. OGC’s goal is to develop each athlete to her fullest potential. This program will develop athletes for possible entry into the National Program. The National Program is for female athletes demonstrating the potential to become a top gymnast in Canada. It is within this stream that International and Olympic level athletes develop. The rules, skill requirements and commitments required of the athlete, parents and coaches are very demanding.